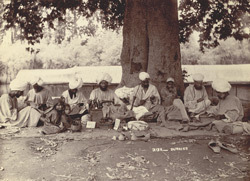 Photograph of a group of tailors seated beneath a tree in the modern-day state of Jammu and Kashmir, taken by an unknown photographer in the 1890s. Kashmiri tailors have produced work of graet distinction throughout the centuries; however the region is best known for its fine textile production and beautiful embroidery. The traditional Kashmiri dress, for both men and women, is the 'phiren', a long, thick woollen cloak, with a thinner cotton underlayer. The 'phiren' worn by women has wide sleeves with bands of traditional embroidery around both the sleeves and open-necked collar. This garment is now mainly worn in the winter as it does a good job of keeping out the cold.